Captain America: Civil War was a massive hit last year and featured most of The Avengers, save for a few notable absences. One of the biggest absences was Thor, whose whereabouts during the events of Civil War have been something of a question mark. Now, we finally have a definitive answer. It turns out that the God of Thunder was busy chasing Thanos all around the cosmos, with little or no success. Screen Rant recently released an interview they had with Marvel producer Brad Winderbaum while doing a set visit for Thor: Ragnarok. During the set visit, he finally, definitively revealed what Chris Hemsworth's Thor was up to during Captain America: Civil War. Just as was alluded to at the end of Avengers: Age of Ultron, he decided to try and find the "puppet master" who has been causing the Infinity Stones to appear, aka Thanos. Here's what Winderbaum had to say about it. "The journey he's been on at the beginning of this movie, it's not like five minutes after Ultron ends we start this movie: it's a couple years later. And as we know, at the end of Ultron he's started this quest to find the puppet master, and the Infinity Stones, and all that. What he realized really fast, I don't think I'm giving too much away because it's right at the top of the film, but basically that one quest, that universe-ending peril that he was trying to figure out dovetailed or branched off into any number of universe ending-perils that he's been adventuring on for the two years leading up to the beginning of this film." The Team Thor shorts, which feature Thor living on Earth with his human roommate Darryl, jokingly explained that he wasn't doing a whole lot during the events of Captain America: Civil War. However, even within those not-so-serious shorts, this journey was alluded to. At one point, we see Thor looking at a chart he's made, which features a "purple man" that he is trying to ascertain the identity of. 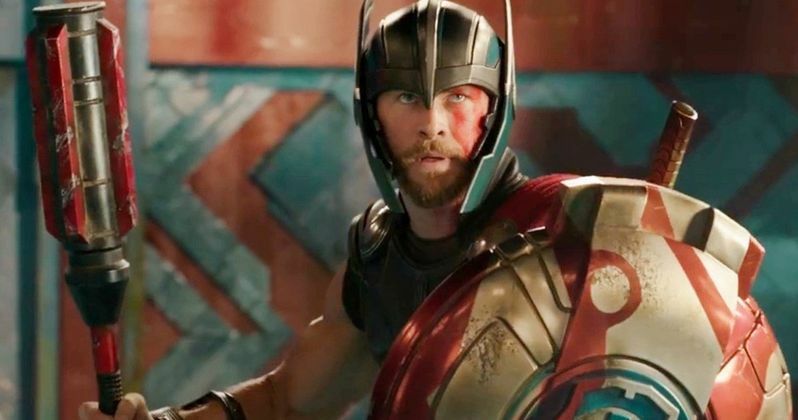 Thor: Ragnarok director Taika Waititi has revealed that these Team Thor shorts aren't canon, but they still managed to hint at the truth. So, how will all of this journeying around affect Thor by the time we see him in Avengers: Infinity War? Here's what Brad Winderbaum had to say about that. "We find him as a lone gunslinger, you know, a guy who's been adventuring around the cosmos for two years right at the top of our movie. He's a more savvy version of the character. In Dark World he has trouble navigating that Dark Elf spaceship...but that's the Thor of the past." Marvel still hasn't released the teaser trailer for Avengers: Infinity War, but it sounds very much like we're going to see a more capable version of Thor in the movie. That's good, because Thanos isn't going to be an easy foe for the Marvel heroes to take down. We'll be able to see some of this growth take place in Thor: Ragnarok, which is set for release on November 3. It sounds like that time during Captain America: Civil War was well spent.